Accepted Scientific Name: Eriosyce aurata (Pfeiff.) Backeb. Cact. Journ. Brit. v. 9, fig. sub nomine Morawetzia Doelziana (1936); et inBlatter Kakteenforsch. 1937, No. 1, p. . Origin and Habitat: Chile (Coquimbo), at medium elevations in the Andes. Habitat: They grow only in the mountain at an altitude of 100-2000 meters or more. Eriosyce sandillon var. algarrobensis (F.Ritter) A.E.Hoffm. Eriosyce ceratistes var. coquimbensis Backeb. 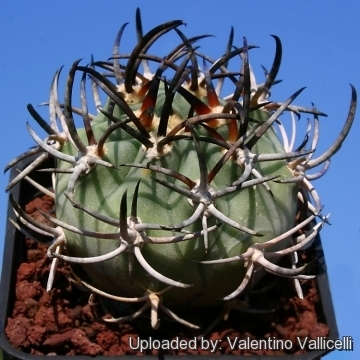 Eriosyce ceratistes var. mollesensis Backeb. Eriosyce sandillon var. mollesensis (Backeb.) A.E.Hoffm. Eriosyce ceratistes var. vallenarensis Backeb. Eriosyce sandillon var. vallenarensis (Backeb.) A.E.Hoffm. 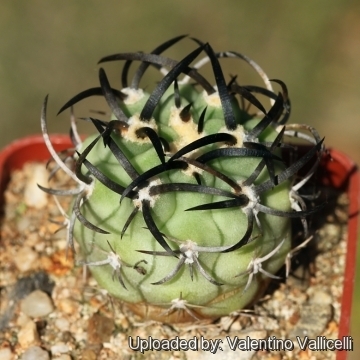 Eriosyce ceratistes var. zorillaensis Backeb. 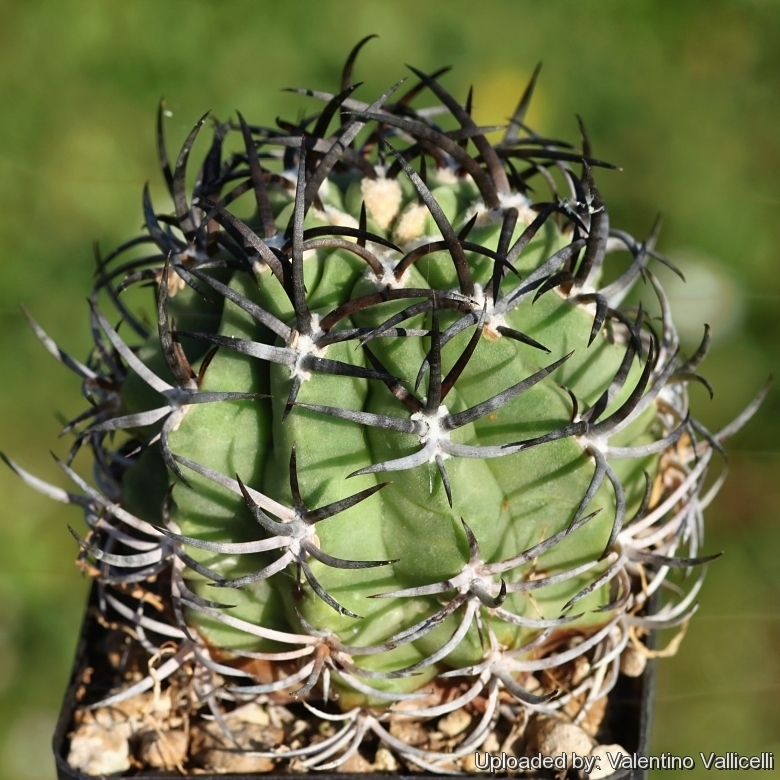 Eriosyce ceratistes var. combarbalensis Backeb. 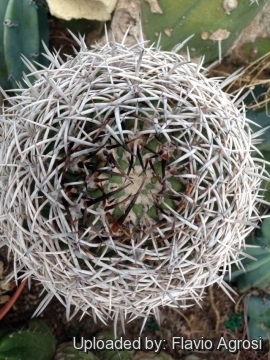 Eriosyce ceratistes var. jorgensis Backeb. Eriosyce aurata var. spinibarbis (F.Ritter) Katt. 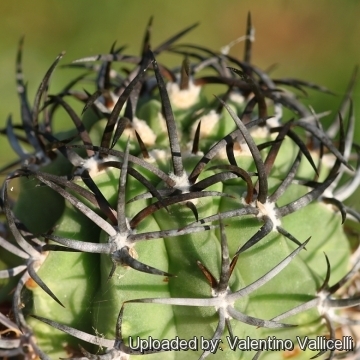 Description: Eriosyce ceratistes is a large barrel-shaped cactus with many ribs and very spiny. Most of the plants in habitat are single headed unless they are damaged. Stem: Solitary, emerald-blue, spherical fattened with abundant white wool on top, up to 50 cm in diameter (usually 20 to 30 cm) when very old become shortly columnar, reaching over 90 cm in height (but usually less). Ribs: Adult specimens have around 21-35 ribs, but fewer in young plant, while in old ones sometime more. Areoles: Large, approx 3 cm apart. 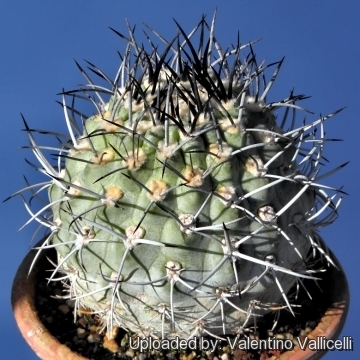 Spines: 11-20 nearly equal 2,5-3,5 cm long, horn-shaped, subulated, straight or slightly curved. The colour is brown to almost black (often pale-brownish or yellowish when very young). Juvenile specimens have 1 central spine and 8 radial, but the number increase as they get older and areoles can have over 20 spines on mature specimens. Flowers: Red campanulate or funnel-shaped 5 cm long, with a white hairy floral tube. Inner perianth-segments 1,5 cm long. The flower open for 3-4 hours and then whitening. There might be over 50 flowers on a mature specimen (only mature specimens bloom). 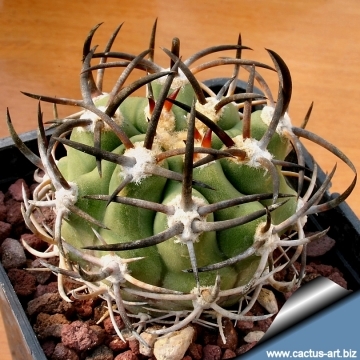 Eriosyce algarrobensis F.Ritter: has stems less than 15 cm thick, larger areoles, 12-18 radial grey-brown spines and different seeds. Distribution: South Algarrobo, Depart. Huasco, Atacama, Chile. Eriosyce aurata (Pfeiff.) Backeb. 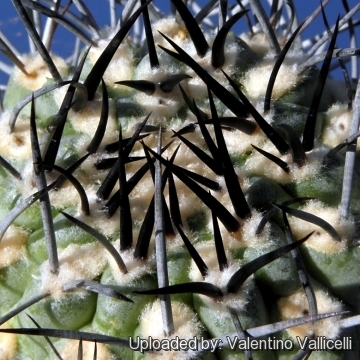 : It is a very large and very spiny barrel cactus that resembles in habit and fruit to some of the giant species of Echinocactus in Mexico. 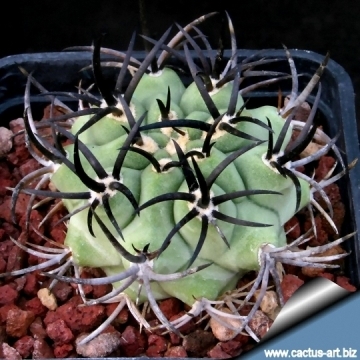 The colourful spines are strong, glassy and usually amber coloured but also bright yellow or pure black. Eriosyce ceratistes (Otto) Britton & Rose: A form with strong black spines. Eriosyce sandillon Phil. : The colourful spines are strong, glassy and usually amber coloured but also bright yellow or pure black. Eriosyce sp. nova JS252 Illapel, 04 Coquimbo, Chile: Form with very strong spines. Cultivation and Propagation: Slow growing, extremely rot prone if kept in a non ventilated place. Requires a very fast-draining drying soil. Water regularly in summer, but do not overwater. Needs a full sun exposure (or light shade) Good heat tolerance. Hardy to at least -5°C. Propagation: Usually propagated from Seeds. (seldom produces offsets), but as this species is very sensitive to root rot the young seedlings are frequently grafted on a strong stock.